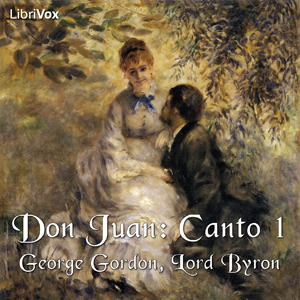 Don Juan is a long narrative poem by Byron, based very loosely on the legend of the evil seducer, Don Juan. The first and second of (eventually) seventeen Cantos composed during Byron's self-imposed exile from England appeared, anonymously, in July 1819 and were greeted with scandal, condemnation, admiration and hilarity. Modern critics generally consider the self-proclamed 'epic', which remained incomplete at Byron's death, to be his masterpiece. (Summary by Peter Gallagher).